L.A. Noire's reliance on facial recognition could be a useful tool for those who have trouble reading other people. 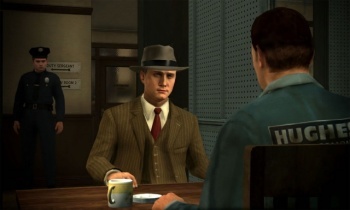 Part of the appeal of Team Bondi & Rockstar's L.A. Noire is its incredible facial animation that lets players deduce whether or not a suspect is lying to them in an investigation. However, that's more difficult for people who suffer from things like Asperger's Syndrome, a disorder similar to autism which (among other things) makes it difficult for people to divine what others are thinking and feeling. Indeed, those with Asperger's might have trouble with the game, Professor Tony Attwood - the author of The Complete Guide to Asperger's Syndrome - told Joystiq. "Certainly, those with Asperger's syndrome have great difficulty in identifying such characteristics [as lying and deceit] as they tend to take people and assume others may be as honest as they are," he said. I think those with Asperger's syndrome would actually find the game quite fascinating as although the player is expected to make a decision on whether someone may be lying, there is the possibility of reviewing and replaying the scene to confirm whether the response was correct or identify the characteristics should a mistake have been made. Attwood suggested those with Asperger's play the game with a friend or relative who could "give feedback and guidance on the characteristics to look for to determine whether someone is lying or not."